Named after a Greek island in the Ionian Sea, Ithaca was founded in 1790 by European settlers who wrested the land from the Iroquois confederation, a group of American Indian tribes who sided with the British during the Revolutionary War. Ithaca literally translates to “cheerful colony.” American soldiers who fought for control of the Ithaca were rewarded by the US government with parcels of land in the city. Many soldiers thought the name Ithaca to be appropriate since they were happy to take the government’s gift. 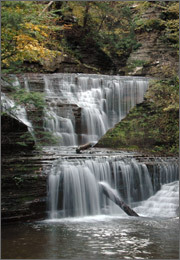 Once the center of the silent film industry during the early 20th century, today Ithaca is known mostly for it lush natural forests, as well as the home for countless artists and musicians. The city originated “The Ithaca Sound,” a unique musical style that mixes both traditional and avant-garde music. Highly trained Ithaca lawyers are in plentiful supply within the city. Though Ithaca has a moderate population of about 29,000 people, attorneys in Ithaca practice across a diverse range of law, including: criminal law, family law, personal injury, estate planning, immigration, zoning, planning and land use law, and bankruptcy to name only a few. Recently a local evangelist was fined for violating an Ithaca noise ordinance. He was accused of preaching too loudly in a public street. The evangelist took his case to an Ithaca attorney who, through research, determined that the ordinance the evangelist was accused of violating was overturned by the United States 2nd Circuit Court of Appeals. The Ithaca lawyer successfully sued the city and won a judgment reaffirming the 2nd Circuit Court’s ruling that the ordinance was unconstitutional, along with a monetary award for the evangelist. Ithaca residents looking to file a lawsuit would find it best to locate a knowledgeable Ithaca lawyer to assist them in the process. Ithaca attorneys must be familiar with both the 6th Judicial District Court, as well as the Ithaca City Court, which consist of multiple judicial departments such as Traffic Court, Civil Court, and Drug Court. Finding the right court on your own if you’re an Ithaca resident can be difficult, that’s where we come in. LegalMatch.com offers a unique personalized attorney-client matching service. We take your individualized legal issue and, based on your description and specific preferences, match you with a lawyer that’s a perfect fit just for you. It’s simple and saves you both time and money.